The Accouphène tuxedo is decorated with 13 soft speakers, created by embroidering decorative coils of highly conductive yarn on the front of the jacket. The coils are connected to a central circuit, which sends pulses of energy through the coils. Sounds are generated when the sleeve of Accouphène, which contains a stitched magnet, is moved over the coils. Accouphène creates a 3D sonic environment around the human body that can be activated and modulated through hand movement and the twisting and compression of the cloth. When powered, speakers generate a weak magnetic field that react to a strong magnet positioned in close proximity to the fabric. The magnet's strength and its distance from the embroidered coil determine the amplitude of the sounds. 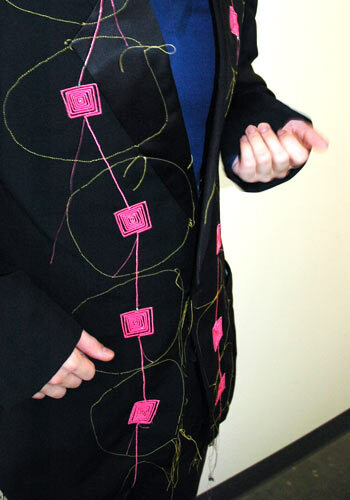 By electronically pulsing the embroidered coils at different frequencies, Accouphène can play different notes.